Sharing with you a French Macarons Recipe that has been very successful for me. I am including a list of the tips for successful French Macarons that I adhere to and a video showing you my French Macaron recipe and step by step procedure for making these delightful treats. Oh, and let's get this little bit of housekeeping out of the way, we are talking Macarons here, not Macaroons. French Macarons (with ending syllable sounding like on)are the little French treat comprised of air-filled, crunchy and slightly chewy tops and bottoms filled with some sort of yumminess while Macaroons (rhyming with moons) are heavier and often made with coconut. A French Macaron Recipe is one of those that intimidate even the veteran home chef. And granted, they have earned their reputation as being a little finicky…egg whites need to just be at the perfect temperature, pastry bag needs to be held perfectly vertical to your cookie sheet, they need to ‘rest' for a bit before they go in the oven, etcetera, etcetera, etcetera. I have included 14 Tips I follow to increase the likelihood of successful macarons towards the bottom of the post, as well as the video showing the step by step process I use to make macarons. Make sure to check them out. No beating around the bush here, any French Macaron recipe is a little equipment intensive. I would consider all of these, with the exception of the mats, necessary for successful macarons. Kitchenaid Stand Mixer. This is the one I have and at this writing it is actually a really good price on Amazon…cheaper than I bought it on sale at Costco! Kitchen Scale …I recently purchased this one after my previous one died. It had served us well…weighing out compost for science experiments in addition to it's more typical kitchen tasks. 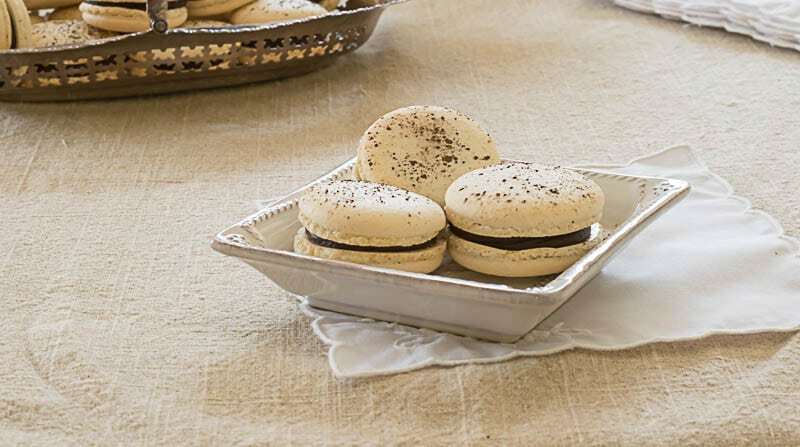 An easy and reliable step by step recipe for French Macaron and Espresso Chocolate Ganache. Different flavors and color can be added as desired. Add almond flour and powdered sugar to the bowl of a food processor and pulse several times to combine. Do not mix too much or almond flour will get sticky. If using espresso powder, add now. Fold egg whites into almond/powdered sugar blend and fold together with the spatula until paste forms. Do not overmix. Set aside. Beat egg whites on high in an electric mixer until 'bubbly', then add sugar. Continue to beat until hard peaks form when you hold the whisk up...approximately 15 minutes. Check after 10 minutes and then every minute until a hard peak. If adding food coloring add now and beat just until incorporated. Gently fold half of the meringue mixture into the batter and then the second half. Continue to fold until mixture resembles a molten lava consistency or you it ribbons when held above the bowl with a spatula. Alternately, add a dollop to a plate, if the peak falls and the macaron is a slight convex, you are ready to go. Fill piping bag, fitted with a 1A tip, with a macaron batter. Carefully pipe similarly sized circles onto a silicone mat or parchment paper. If using a silicone mat, ensure that mats are clean and dry. When finished, slam the baking sheets onto the counter a few times to get all of the air bubbles out. If using sprinkles, add now while macarons are still damp. Let macarons rest for at least 30-45 minutes before baking. Touch tops of macarons to ensure that they are dry before putting in the oven. Preheat oven to 325'. Convection ovens are great for macarons. Bake for 10-14 minutes...1 tray at a time. Let cool for 10-15 minutes and peel off mat by bending mat away from the macaron. Both macarons and ganache can be made ahead of time and stored separately. Freeze the macarons for up to 6 months and refrigerate the ganache for up to one month. So, given all the work that goes into whipping up a batch of these, why would you want to spend a couple of hours dedicated to this French Macaron Recipe? Well, number one…pride. And the challenge of it. Honestly, I have made 4-5 batches using this French Macaron recipe and only had one sheet come out bad because I realized I didn't ‘drop' the cookie sheet to release the air…they ended up being a little puffy. But that being said, they were still pretty good to munch on! And two, three, four, five, etc… Because they are just so…cool and a little impressive! Imagine serving them at your next party, or gifting them to friends, or as a party favor! These little boxes held 2 macarons perfectly. For meringue, instead of caster or extra fine sugar, you can process granulated sugar through a food processor. You can check to see if the batter is appropriately mixed by seeing if it ‘ribbons' when held up by the spoonful and it is allowed to run off of the spoon. Alternately, you could put a small dollop on a tray and if the peak ‘dissolves' so that the top is slightly convex without any peaks. While I haven't done it with this recipe and have always had success, for my next batch I will be adding a pinch or two to the sugar when I add it to the egg whites for the meringue. The cream of tartar really helps stabilize the egg whites. Put one tray in at a time…if you are not sure of your oven temperature reliability, you might consider only piping a couple for the first baking to make sure that they don't turn brown while baking. This will slow down the process but will increase the likelihood of success. Don't open the oven until you are ready to remove your macarons. If they stick to your mat, they are probably a wee bit undercooked…make a note to add a few more minutes the next time. The tops and bottoms can be baked in advance as they freeze beautifully! Jot down notes on your recipe when you nail down your perfect oven temperature and baking time. 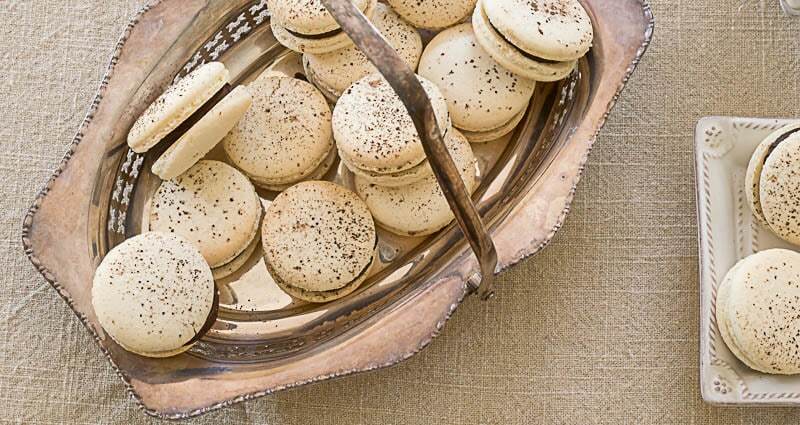 So if you want to try your hand at macaron baking, then give this French Macaron Recipe a try! Bookmark this page or pin the following image for your future reference. Thank you so much. I have wanted to tackle this for some time, but frankly nervous about producing a successful great macaron. I feel very privileged to have found your blog and I love the way you describe and present your material. It makes the person on the other end “feel” like they can do it. Oh Laura, you just made my day! More than anything I do hope to encourage my reader family that if I can do it, so can you! And hearing from you that I might have succeded a wee bit filled my heart! I am privileged to have you as a reader my friend. Please do let me know how your macaron adventure goes! Lynn my girl is always on the lookout for the perfect macaron recipe. I have to share this one with her and hopefully get to taste your wonderful recipe. Oh you lucky girl! Even better than baking macarons is someone to bake them for you. Just returned from a whirlwind weekend in NYC! Such a fun time. I know you are enjoying being back. Oh Vera, really enjoy making these treats…and what’s the worst that can happen…right? Do try them out and let me know just how great you did!